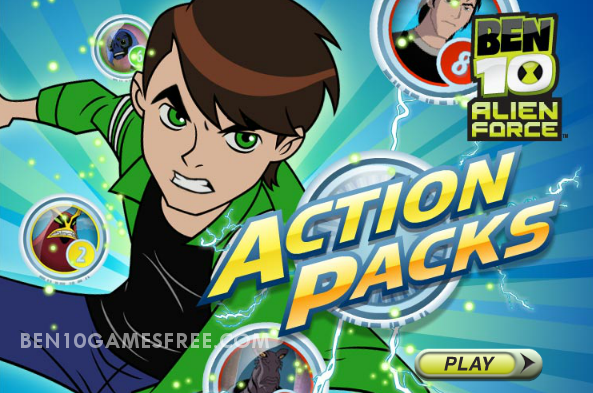 Another full of action game added to the Ben 10 Alien Force Games Category – Ben 10 Action Packs. This time you have to take the solid decision that is either to save the earth or rule it. In Ben 10 Action Packs Game, firstly you have to choose either you want to be in a team of villains or Heroes. And in the second part, you have to choose the way by which you will be playing the game: by points or colors. Recommended: Play Ben 10 Ultimatrix Unleashed Game online for Free! Ben 10 Action Packs game is a single player game in which you are competing against the computer for the points or more of one color token. The tokens you will collect have the Ben 10 characters printed on them. Each unique character printed on the Token will have the different points. The token from the Omnitrix counted as any Ben Token. Some Tokens you collect will have no power and can only get you the points that are printed on them itself. There will be a two-round played between you and your competitor. After the two round, you can swap your token for another and choose a color. In the end, the player who will have the more tokens of the same color will win the game. Look for the Tokens which have the special power and extra points tom= make you win the Game! Don’t Forget to give your rating for Ben 10 Action Packs game and share your tips and tricks to win this game in the comments section below.